Nominee agreements for land ownership are prohibited if the basis is to transfer restricted land rights to foreign parties. Foreign parties are only entitled to land under a right to use (Hak Pakai) or leasehold. 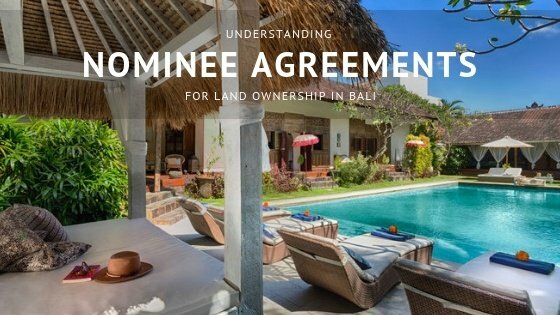 More specifically, the Agrarian Law has expressly stated that freehold land can only be owned by Indonesian citizens or legal entities as determined by the government. The release of a freehold right under the above must be realized within one year after a party obtains land (point a), loses his citizenship (point b), or secures foreign citizenship (point c). If not, the freehold right will be deemed as removed by law and the land will be taken over by the state. Further, the Agrarian Law also prohibits any sale and purchase, exchange, grant, or activity which directly or indirectly transfers freehold land to a foreign citizen or legal entity (unless the legal entity is determined by the government). Any such transfer will be deemed as null and void and result in the respective land being returned to the state. As a consequence, any nominee agreement that provides for the transfer of freehold land to a foreign party will be deemed as not having an admissible cause as it violates the above provisions. The nominee will acknowledge that land registered under his name actually belongs to the beneficiary who provided the funds to purchase the land. In addition, the nominee will provide an irrevocable power of attorney to authorize the beneficiary to conduct any activities on the land. The nominee will provide the beneficiary with options to purchase the land that was purchased by the nominee with the beneficiary’s fund. The nominee will lease the land to the beneficiary for a certain lease period, with an option for an extension. The nominee will grant his land and properties to the beneficiary. The beneficiary will provide certain funds as a loan for the nominee to purchase the land. Following the loan agreement, the beneficiary and the nominee will enter into an agreement which uses the respective land as collateral for the loan under a mortgage mechanism. Based on the above, it can be reasonably concluded there are serious questions about the validity of so called nominee arrangements between foreign parties and Indonesian parties for investment and land ownership purposes. The general nature of such arrangements is to circumvent applicable laws and regulations, and nominee practices are expressly prohibited under the Investment Law and Agrarian Law which deems them null and void. In this regard, some foreign parties (beneficiaries) go as far as formalizing nominee agreements by having them made into an authentic deed before a notary. The intent is that a notarial deed will provide more legal certainty and may be used as a powerful instrument to evidence their rights over the agreement’s objects (shares or land), particularly if there is a dispute between the beneficiaries and the nominees. Noteworthy, however, is that a notarial deed does not necessarily provide a better position for the beneficiary as there are still many potential issues regarding the validity of the nominee agreement itself which leans in favor of the nominee, despite the agreement being drafted using a notarial deed. There is little doubt that nominee arrangements raise serious questions about their validity and enforceability. Despite such concerns, and for historical and other reasons, the fact remains that many nominee arrangements currently exist for both investment and land ownership purposes. The question then becomes, what should be done about existing arrangements and also going forward? Are there a number of serious time bombs waiting to explode, will practical considerations solve the problem, or can more refined arrangements be formulated that properly accord with the law? Buying property in Bali could be a great decision and lucrative investment if approached correctly. That is why you should always seek professional legal assistance to avoid any disappointment or frustration. If you wish further information, we recommend that you contact a Lawyer/legal adviser or speak with a notary, who can help to answer any legal questions which you may have.